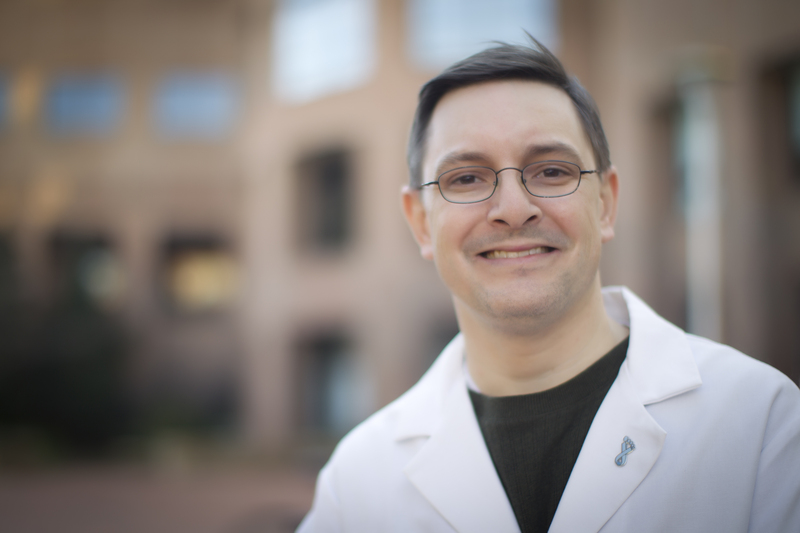 In a pair of preclinical studies published in the journal Neuro-Oncology, UNC Lineberger’s C. Ryan Miller, MD, PhD, and the Phoenix-based Translational Genomics Research Institute report on the genetic evolution of glioblastoma as it progresses in severity and a potential strategy to treat this often fast-growing brain cancer type. C. Ryan Miller, MD, PhD, a member of the UNC Lineberger Comprehensive Cancer Center and associate professor in the UNC School of Medicine. In a pair of preclinical studies published in the journal Neuro-Oncology, researchers from UNC Lineberger and the Phoenix-based Translational Genomics Research Institute report on the genetic evolution of glioblastoma as it progresses in severity and a potential strategy to treat this often fast-growing brain cancer type. While the treatment strategy showed the promise of precision medicine in preclinical models, their findings also highlighted two limitations of this approach – the ability of drugs to reach their target in the brain and the strength of their effect once they reach it. “Knowing the mutations that are driving a tumor over time could help us predict the genetic course of the disease, so that we can intervene in a more specific fashion,” said the study’s senior author C. Ryan Miller, MD, PhD, a member of the UNC Lineberger Comprehensive Cancer Center and associate professor in the UNC School of Medicine. The first study showed that mutations affect how cancer starts in glial cells — brain cells that provide support and insulation for neurons — and how those mutations affect the way cancer evolves from low-grade gliomas to full-blown high-grade glioblastomas, the most common and deadly of the primary brain cancers. “The results of both studies help us continue to paint a more defined picture of how glioblastoma starts, evolves and kills, and how we might find a way to slow it down and eventually stop it,” said TGen Professor and Deputy Director Dr. Michael Berens, one of the study’s co-authors. Berens is also director of the Cancer and Cell Biology Division and head of the Glioma Research Lab at TGen. For the first study, researchers developed models to examine the influence of mutations that promote cancer development on the initiation and progression of gliomas, and how tumor genomic profiles evolve as the cancer progresses. The results suggest the simultaneous activation of certain molecular signaling pathways — in particular, the MAPK and PI3K cellular pathways — triggered tumor initiation and produced increasingly dense low-grade gliomas that quickly progressed to glioblastoma (GBM). In the second study, researchers tested treatments that specifically target the PI3K and MAPK pathways, two of the commonly mutated “core pathways” in this cancer type. While the treatments overcame resistance in preclinical studies done in models outside of the brain, they believe it didn’t reach high enough concentrations to be effective when tumors were in the brain. “These results demonstrate the importance of evaluating drug efficacy within the context of the native tumor environment, and highlight the potential for combination therapies to target core glioblastoma pathways if penetrance of kinase inhibitors to the central nervous system can be improved,” said the study’s first author Robbie McNeill, a graduate research assistant in the UNC School of Medicine Department of Pathology & Laboratory Medicine. Individual UNC researchers involved in the studies were supported by the Damon Runyon Cancer Research Foundation, U.S. Department of Defense, University Cancer Research Fund, the NIH National Center for Advancing Translational Sciences, the Howard Hughes Medical Institute through the UNC Graduate Training Program in Translational Medicine, the National Institutes of Health, the Robert H. Wagner Scholars Program in Pathobiology and Translational Science and the American Brain Tumor Association. Researchers from TGen were supported by the Ben and Catherine Ivy Foundation.